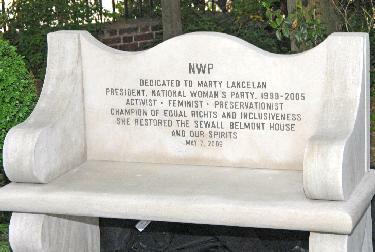 On May 7, 2006, the National Woman's Party had a reception and dedication ceremony, attended by about 150 people, at its headquarters, the Sewall-Belmont House on Capitol Hill, to honor its immediate past president, Marty Langelan. 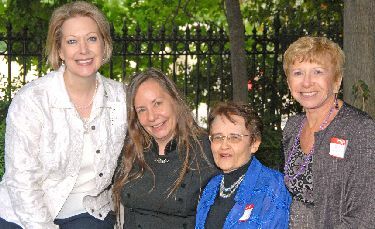 The committee that planned the event was headed by Sondra Seba Hemenway and included Sonia and Dr. Fann Harding as members. 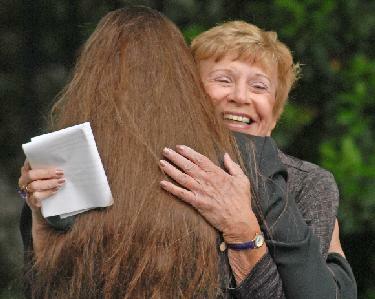 Sondra had primary responsibility for the entire event, she and Fann designed the stone bench and pedestal dedicated to Marty in the garden of the House, Sonia drafted the inscription for the bench and the Lifetime Achievement Award (LAA) that was presented to Marty and gave the principal talk. NWP retained Emily Glazer who did the calligraphy and provided editorial support for the LAA. Marty and Sonia hugging after Sonia's talk. 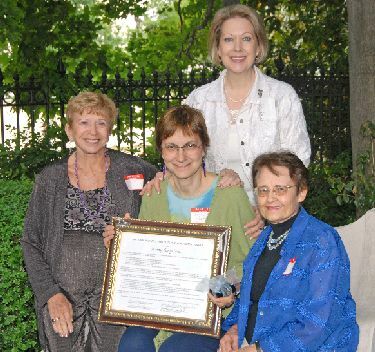 Standing: Sondra; seated from L to R: Sonia, Emily (holding the LAA), Fann. From L to R: Sondra, Marty, Fann and Sonia.